This statistic shows the population of the Netherlands in 2018, by background. 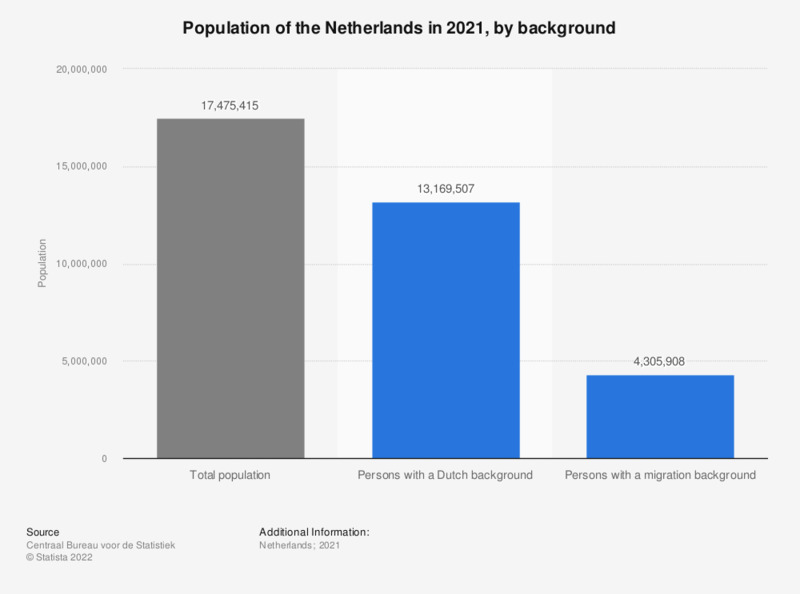 Of the nearly 17.2 million people living in the Netherlands in 2018, roughly 13.2 million people had a Dutch background and four million people had a migration background, defined as first or second generation migrants. Of the non-Western population, the majority of the inhabitants had a Turkish background, as can be seen in this statistic on the background of the non-Western population in the Netherlands. The second-largest group is formed by the population with a Moroccan background. These groups consist of respectively roughly 404,000 and 397,000 people. According to a recent forecast, both the population with a Western background and the population with a non-Western background is likely to increase in the future. It is estimated that by 2060, approximately three million people in the Netherlands will have a non-Western background. Persons with a Dutch background: someone whose parents were both born in the Netherlands. Persons with a migration background: someone who has at least one parent born abroad.